Knight Rider Classic premired in the fall season of 1982 and ran till 1986. 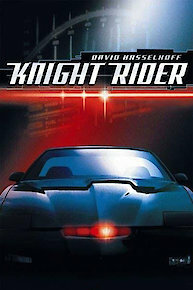 It stared David Hasselhoff and a high tech talking car owned by Knight Industries named KITT. This show was really entertaining where Michael Knight played by David Hasselhoff would work along side Knight Industries a group called the foundation which is lead by Devon Miles played by Edward Mulhare. They took on assignments to help save people from bad positions and missions to solve crimes. How Michael Long became Michael Knight. He was a police detective that was shot and was close to death, when Wilton Knight of Knight Industries saved him and did total reconstrution and plastic surgery and he became Michael Knight. Michael was a was an excellent fighter, and worked well with his new partner a Car, that was not just any ordinary car it was KITT. KITT or otherwise known as the Knight Industries Two Thousand was a black Pontiac Trans Am with lots of gadgets and gizmos.KITT also had a female mechanic named Bonnie played by Patricia McPherson to keep him running in tip top shape. The coolest part about KITT was that he talked and could carry on a conversation with you. The voice of KITT was played by William Daniels. KITT was bullet proof, and he had a turbo boost that would put NOS power to shame. He could eject anyone who may have ever offended him or was not suppose to be inside. There were quite a few times he would send people sorrowing for lack of permission to be there. He could also drive himself anywhere, and had brains to compute or do about anything without any humans even prompting him. Numerous times he saved Michael's life and many other guest stars from near death. When he interrupts a robbery, Michael is shocked when one of the thieves commits apparent suicide, jumping out of a high-rise window. As Micheal investigates, it turns out a con woman posing as a voodoo princess is using special earclips that submit the wearers to become zombified slaves to her commands. Things become worse when Michael falls under her command. Devon enlists Michael and K.I.T.T. to protect his friend's adopted son, who has become the target of a kidnapping plot. The case takes a strange turn when FLAG learns that the boy is rumored to be a descendent of an ancient cult leader. Michael must fight off a Japanese terrorist cult. Nick O'Brien, a close friend of Devon's and owner of O'Brien Shipyard asks Michael to investigate why Suki Tanika, a powerful industrialist, is trying to run him out of business. His main concern is his fifteen-year-old son, Coy, a Japanese child he adopted. The Foundation learns that Tanika is trying to reinstate the Uyoku Cult--a terrorist group abolished after the war and illegal in Japan. Michael and K.I.T.T. learn that Tanika wants Coy as he is Kasuga Sukuritsu, and must be ordained Emperor Prince of the Uyoku. Michael must go through a sea of lava in a Central American country to rescue an American accused of supporting the overthrown president of the nation by the military dictator who has usurped the power. When an arsonist responsible for a string of devastating forest fires employs a special all-terrain vehicle to elude Michael and K.I.T.T., Bonnie creates a high-tech surveillance drone to help even the playing field. A mobster, who has escaped from the F.B.I., uses a dune-buggy race as a cover to reach the US Mexico border where a new identity awaits him. When Michael and K.I.T.T. are sent in to investigate the mysterious death of a sports reporter, they discover that the victim was in possession of incriminating information about a controversial boxing match. Michael finds himself in between a rock and hard place when Bonnie develops a crush on a celebrity magician who may be the mastermind behind the murder of a Foundation trustee. Real-life magician Lance Burton guest stars. When Michael is sent in to investigate a heated incident between members of a family-owned logging outfit and a large lumber corporation, he uncovers a conspiracy revolving around the sale of pirated timber illegally cut from a national forest. Episode 13 - Killer K.I.T.T. A disgruntled computer technician and former Foundation employee hatches a vengeful scheme to destroy the agency by hacking into K.I.T.T. 's system and reprogramming the super car to assassinate Michael. Following a shooting that nearly claims his life, Michael descends into a deep depression and contemplates retiring. Searching for a way to help him snap out of his funk, Devon arranges for Michael to be reunited with his former flame, Stevie. RC3 needs Michael's help when a powerful real estate developer is trying to take over the old neighborhood. Michael and K.I.T.T. go into prison to track down an inmate who committed a break-in. Using his connection with a prison warden, Jason Nelson uses inmates to commit break-ins. Julie and Samantha work together on assignments for Nelson. They set up their target, gain access to their home or office by pick-pocketing the keys, I.D. 's, etc., and deliver the money or other valuables to their boss. Nelson has complete control over the women through the prison warden, a shrewd and cold person named Brooks. Brooks' intimidating approach keeps young ladies like Julie and Samantha doing their "work." When the ladies gain access to the office of a businessman who had blueprints depicting a specific hotel, Devon's concern about the safety of an upcoming convention grows and Michael and K.I.T.T. track the inmates down. Bonnie becomes concerned for her friend's safety when the Indy racing team he works for is hit with a string of mysterious accidents. Suspecting foul play, Michael poses as a driver to investigate the incidents. Michael is forced to return from his much-deserved birthday vacation when the Foundation learns that a black market arms dealer has stolen a high-tech hovercraft prototype and plans to sell it overseas. When the perpetrator behind a plot to smuggle biological weapons out of the country is identified as a racing enthusiast, Michael and the Foundation use a tricked-out K.I.T.T. to lure him out into the open. Michael and K.I.T.T. help people from a Native American tribe ward off a group of greedy oil diggers. The disappearance of Dr. Quentin Tanner and his college protégé Barbara Ralston prompts the Foundation to send Michael on a mission to find both scientists. Tanner, an archeologist, and the young woman were digging for an ancient American-Indian treasure and had enough evidence indicating its location. Michael asks Susan Christopher to help him find Dr. Tanner and Barbara. Susan is a social worker and her interest is, as is everyone else's, to have the burial grounds declared a national shrine. Instead ruthless Cyrus Oakes wants to start digging for oil. Bonnie finds herself in the middle of an international incident when a former U.S. intelligence officer hijacks the plane she's traveling aboard and demands the release of a group of political prisoners. Michael's efforts to apprehend an elusive criminal mastermind are thrown for a loop when his friend Karen is kidnapped and used as bait in a ploy to trap and steal K.I.T.T. Janine Turner guest stars as Karen. Michael Knight and K.I.T.T. put their lives on the line as they try to catch up with a band of dangerous crooks and blackmailers. Michael and K.I.T.T. are urgently needed when all hell breaks loose in a state penitentiary. After shooting the guards and escaping in the Commissioner's car, Jeffrey Cavanaugh and his cellmate Lukas have freed themselves. Michael, who was on his way to go sailing with Karen, finds himself in the line of duty again. When a freak accident claims the life of an aerial performer and threatens to cripple a family-owned circus, Michael and K.I.T.T. go undercover as a high-flying daredevil act to determine if foul play is afoot. Thieves steal a stash of guns during a daring police warehouse heist. When several of the stolen laser rifles turn up at a popular gun convention, Michael goes undercover as a survival enthusiast to sniff out the culprits. When blackmail turns into murder of a close friend of Bonnie Barstow, Michael poses as a scientist to gain entrance to an exclusive retreat where the owner is dealing in top-secret weapons. Bonnie has just received the news that her good friend, Harley Freeman, a brilliant computer scientist was killed in a car accident. Freeman had been one of Bonnie's professors at M.I.T., and it had developed into a very good friendship. It was reported that Freeman's car had crashed into a power pole, and one of the wires had electrocuted him. Indications were that he had been drinking pretty heavily, but as long as Bonnie knew him, he only had an occasional glass of wine at dinner. When a ruthless corporation resorts to intimidation, hijacking and murder to force a small group of independent truckers out of business, Michael and K.I.T.T. step in. James Cromwell guest stars in this action-packed episode. When the daughter of a renowned scientist is kidnapped by a group of thieves looking to get their hands on a new high-tech laser, Michael and K.I.T.T. employ the assistance of FLAG's resident computer nerd, Elliot, to help rescue her. When Michael learns that the sponsor of small-town road rally received death threats and is being pressured into canceling the event, Michael and K.I.T.T. pose as competitors and uncover a link to local mobsters. When a mysterious accident claims the life of a laborer who was working on the construction of a new government space weapons headquarters, Michael is sent in to investigate and uncovers a sinister plot devised by a criminal mastermind. An employee-owned armored car company faces dissolution when a test driver is killed during a routine missile defense demonstration. Suspecting foul play, Michael volunteers for the next test in hopes of flushing out a saboteur. K.I.T.T. is nearly destroyed when it's dropped into an acid pit during a raid on a toxic waste facility. Following extensive reconstruction, K.I.T.T. is thrust into the line of fire again when it squares off against a menacing monster truck. While trying to corner a feared industrialist who is spilling chemical waste, K.I.T.T. is totally destroyed and Michael must help his friend to regain strength. Fran, a wildlife photographer, is trying to prove that industrialist Birock disposes of his chemical waste in an illegal manner, destroying everything that is alive around him. Every time she is about to prove to the authorities Birock's wrong-doing, a fire would break out and burn all the evidence. Michael and K.I.T.T. pay Birock a visit which ends up in complete disaster when K.I.T.T. is dropped into an acid-filled pit by a monstrous junkyard dog. Michael and K.I.T.T. are after a loan shark who sends his deadly driver out to kill those who might stand in his way. Two people have been killed and when a third murder happens, Devon makes a connection between them. The man behind this is D.G. Grebbs who hires muscle men to go around "cleaning" his money. He is a loan shark who has his hands in the garment industry, "helping" designers who have little or no cash but good ideas. Michael poses as a mercenary to track down the elusive Chameleon, a master of disguise, who stole sophisticated government weapons with the intention of selling them to the highest bidder. On the way to a District Court appearance, the Chameleon, alias Gordon Baxter, is able to overpower the guard even though they are hand-cuffed together. With the guard's gun, Baxter forces Judge Edith Webster to give him her robe, then with a latex mask, the judge's robe and some make-up he is able to slip out of the courthouse. He commandeers a dry-cleaner's van, and the man with the thousand faces and voices is free again! It is Michael's assignment to track him down. During a robbery, a giant explosion damages K.I.T.T. 's memory, and K.I.T.T. and Michael are separated. A young boy who's on the run finds K.I.T.T. roaming the streets, and the two team up against a gang of dangerous thieves. Michael is framed with heroin possession and suspended from the Foundation. He confronts a big-time underworld figure in New Orleans, Boyd Lasalle, asking him to clear up the situation. Instead, Michael discovers that the Foundation has now fired him and Lasalle offers him $50,000 to steal K.I.T.T.. Michael kidnaps K.I.T.T. and returns with the car in the middle of a birthday party for Linda, Lasalle's girlfriend. The second phase of Lasalle's plan is that Michael obtains a key to the world's most secure lock -- which is in Devon's safe. Michael and K.I.T.T. go western when they descend upon Sage City to help Rebecca Hammond stop the cattle rustling on her ranch. Episode 6 - K.I.T.T. vs. K.A.R.R. K.A.R.R., K.I.T.T's prototype, is unearthed on a beach by a auto mechanic. He repairs K.A.R.R. unaware of the evil capacity that K.A.R.R. possesses. Michael and K.I.T.T. meet their match in a seemingly indestructible adversary -- K.A.R.R. -- K.I.T.T. 's alter ego. While at the beach, John Stanton and his girlfriend, Mandy Moran, uncover a Trans Am buried in the sand. It is K.I.T.T. 's exact double. Soon freed, John takes it for a ride in awe of its high-tech computer technology. Michael and K.I.T.T. are horrified to discover that K.A.R.R. is operational as they thought it was destroyed some time ago. K.A.R.R. is a Foundation reject! When Michael learns that the daughter of his former partner has been injured in a hit-and-run incident involving a high-tech sports car, he competes in an illegal street race to flush out the culprits. Michael (David Hasselhoff) uses his trusty car, K.I.T.T., to embark on a search for $3 million in stolen diamonds in Napa Valley. Michael and K.I.T.T. 's search for three million dollars in stolen diamonds leads them to the Monk's Cellar Winery. Michael, Bonnie and Devon are in the Van Decker Auctioneers building overseeing the sale of a Foundation benefactor's estate, the money of which will go to charity. As the beauteous Jody Tompkins models the diamonds, Charley Winters and Lyle Austin enter wearing motorcycle helmets, robbing Van Decker of the diamonds. Michael and K.I.T.T. take pursuit yet lose the motorcyclists. While visiting Jody, Michael receives a call from Devon explaining that Charley Winters shot Lyle Austin and took all the jewels. Michael and K.I.T.T. find the wounded Lyle...and discover a plane ticket to Napa. In the two-hour season premiere, Michael and K.I.T.T. reunite with their old Foundation co-worker and friend, Bonnie Barstow, to stop the theft of a surveillance and strike satellite by an electronics genius. Knight Rider Classic is currently available to watch free on NBC and stream on NBC. You can also stream, download, buy, rent Knight Rider Classic on demand at Amazon, Vudu, FandangoNow, Google Play, iTunes online.